In November of 2010, Portland Bolt provided over 23,000 pounds of tie rod assemblies to support the roof structure as part of a $31 million renovation of Providence Park (formerly PGE Park) in Portland, Oregon. The 2015 MSL Cup Champion Portland Timbers now claim to possess the most intimate, exciting and authentic soccer facility in the United States. 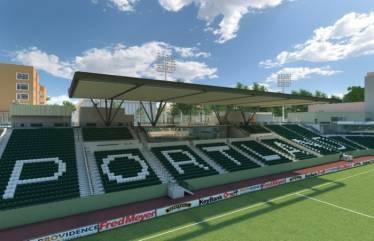 In addition to providing a home for the Timbers, Providence Park will also host more than 250 events annually, including Portland State football and an array of youth sports and community-based events. Portland Bolt provided prime painted, A572 grade 50 tie rods measuring 2¾” diameter in lengths of 52.5 feet and 34 feet. The longest rods were spliced together using 2¾” x 8½” coupling nuts, while the shorter lengths were supplied as a single rod. Number 8 clevises were assembled to each end of the massive assemblies. Portland Bolt was the natural choice to supply these assemblies due to both our close proximity to the jobsite and our experience in supplying anchor bolts and tie rod assemblies for stadium projects throughout the United States and Canada.